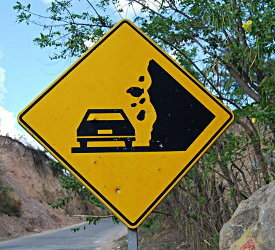 Falling Rock Signs in Central and South America are peculiar in that they show a car in most countries. There is a wide spec­trum of different cars with a wide range of number of rocks (e.g. Argentina, Ecuador). But all this diversity is slowly disappearing. While the find from 1993 was local breed, in 2011 Mexico and Guatemala share the same design. The same is happening with all the other roadsigns. 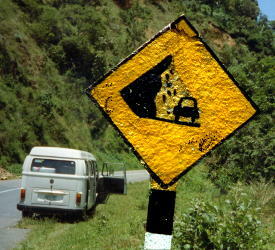 Why aren't roadsigns not considered cultural heritage? And preserved accordingly by UNESCO?